The Superloops premiered in the early 1970s, manufactured by Larson International who at this time had only produced tractors and other agricultural machinery from their establishment in 1965. 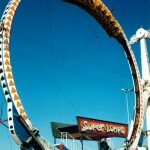 Superloops was invented by Walter House (also Gravitron) and his prototype unit travelled North America with Century 21 Shows for many years before being sold to an Australian showmen. The loop’s 20 person train shuttles back and forth around the inside of the loop, attached to an inertia ring – a circular 360° conveyor-belt locked into a track. 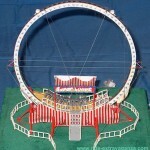 This inertia ring is powered by the friction of hydraulic motors in the ride’s base, providing it with both clockwise and counter-clockwise movements at the discretion of the ride operator who sits in a steel frame immediately beside the track. 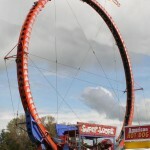 The Superloops is truly unique in its design, with no other ride coming close to its easily recognisable 23-metre (55 ft) steel ring construction. 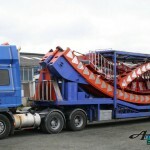 Perhaps the most intriguing element of this ride is the ingenious fold-up design that is not only capable of fitting onto a single trailer, but also self-assembling; via 2 large hydraulic rams at the loop’s base, each third of the loop folds out while the upper portions, in turn, hinge upward eventually connecting at the top-centre. 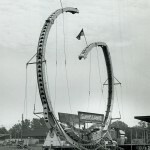 (the fastening of the top of the ring is a very precarious process, as viewed below) Support cables are then anchored into place for lateral support to the free-standing steel ring. The ride can be set up with only two men in as little as 2-3 hours. With great draw card value and dominant circular construction it easily catches attention of passers-by while also polluting the midway with its distinct loud clattering as the train rockets around the inside of the loop; further adding to its unique appeal. 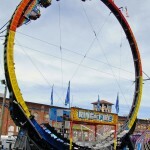 The Ring of Fire premiered in the late 1980s sporting computer programmed turbo lights around the ring, which now illuminated 360° under the base, with a re-designed inertia-ring to minimise noise and maintenance. In 1998 Fireball premiered with a modernised train (over-the-shoulder restraints) and roofless passenger train. To date there have been approximately 100 Superloop-type units constructed worldwide, a number in Europe manufactured by Vekoma and at least 1 unit manufactured in Australia by CAMAC both under license from Larson. 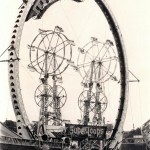 In recent times the Superloops and its later generations have become less common with the abundance of higher-capacity double vehicle Kamikazes which have proven easier to assemble and maintain also with single trailer portability and perhaps a more modern appeal to today’s generation of carnival goers. Nevertheless, the sight and sound of a 55 foot Superloops / Ring of Fire / Fireball on the horizon of any carnival is something that will always hold an excitement of its own. I love that ride called the wring of fire, it’s alot of fun! I will be going on it again, at the illinois state fair again this year! the only scarry part is when you are upside down but it’s alot of fun though. I operated the SuperLoop in Australia during the early 90’s, it belonged to L&L Osbourne (Showtime) Ltd. We travelled it with a Ghost Train, Ninja Turtle Rocket and various joints (side stalls) the “Bottle Up” being most memorable. The ride never failed to draw a huge crowd and would be busy all day, I used to stop at the top and rock it side to side slightly. I remember feeling like the nuts when stood on the platform looking at the throng on people waiting to ride!!!! To keep the history straight, walter house may have created the idea, but louie wallace engineered the ride. He was the true guinness,not to mention the numerous agricultural designs marketed by larson industries. He also invented the first mechanized bun slicer for baldridge bakery in lubbock tx. Walter cheated louie put of his stock options, and left himhim jobless. It was a great ride through. Royal American Shows carried the prototype of this ride for years. They were the biggest and best, so many manufacturers tried to sell to them first. I rode it again this year. I love it, not to menchin I am totally blind, and love it, it’s really freeky when you hang upside down you like hang their but it’s cool though. to the person who wanted a wave file of it, I don’t actually have a wave, but I do have a mp3 of it, warning, I do alot of cussing, lol. I actually recorded myself on it this year I do have a edited version of the file if that person is interested email at leolizzard85@hotmail.com and I will send the file, all, have a great day.talk soon. forgot to menchin I can convert it to a wave, if anyone wants. Isn’t this ride supposed to use shoulder harnesses? My kid was put in the front car with only a lap bar that did not even reach his lap. He and his buddy had to wedge themselves into the frame and cling onto the car edge to keep from tumbling out. WTF? I knew Mr. and Mrs. Walter House and Debbie and Mark personally.I grew up across the street in Cliffside, Northwest of Amarillo Texas where Mr. House constructed his rides. Mark and I used to be the guinea pigs that first rode the rides literally not more than human sandbags ha ha. The man was ahead of his time. What fun precious memories. They had the most beautiful home in all of Bishop Hills and Mrs. House was one fine classy lady. What wonderful memories it brings back! Debbie used to hang out at our house with my older brother and sister and go on family vacations with us. I think its time for a stand up ring of fire/fire ball its 2013 it can be done. This ride is a crazy son of a gun and I should know because I have rode it before and believe me I wish I had not. If I was going to ride it again I would prefer to ride the newer version with the shoulder harness because the lap bar don’t cut it. 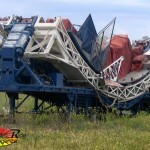 I crashed on a super loop at the Champaign IL County fair July 1981. At full speed the train came to an abrubt dead stop at the bottom. I would never get on one of those things again! I’ve only seen the Fire-Ball and the Ring Of Fire. Never seen a super loops ride. But, i’ve seen a 75 foot one called the flare, and another 75′ one called the brain drain. In the early 1980’s Growing up in Wellington, New Zealand, the winter trade fair used to come to town once a year. I will never forget the first time I saw the “Super Loops.” I was a young kid and I had heard from many others there was this amazing new ride that was new this year. On the night we went, we were walking over the hill and down to the location where the fair was and you could hear the clack clack / whirling noise of the coaster for miles away. When I finally saw it from afar, it was quite a most impressive sight, being all lit up at night it looked like something from another planet! As we got closer the excitement grew so much I could not wait to see it up close. I dont think I actually got to go on it that night as the crowds were massive and the queues far to long but it was just such great fun to watch I did not care. The train was the caged version and it seemed like once you were in then that was that, no going back! I always got to go on it every year after that though and that ride holds a special place in my childhood to this day. Being quite curious in how it worked, I took note of the wheels driving the inner ring, I thought it was quite cool they used normal tires to do this. Also, it seemed like the operator had just as much fun as the passengers on the ride, giggling when the train was upside down for what seemed for ever! David, I remember the name of the Texas Revolver and only remember seeing it once or twice, after that I only saw it called the super loops. I thought I was the only one to remember this, apparently it is indeed rare. I don’t remember what the signage looked like, just remember the name and that it was identical to the super loops. I almost fell out of one of these back in the 80s. The padding on the hold down bar was badly torn and didn’t hold me in the seat. I spent the entire ride with my brother hanging on to my feet and my arm wedged through the side of the cage trying to keep from falling into the other riders. I used to work for Larson Mfg. In Kress,Texas back in the early 1980s. I worked in their assembly dept.and also in paint shop. I have road this ride for over two hours without getting off. When I worked there the ride was rated the safest in the industry. Tienda online de banderas. Fabricantes de banderas, mástiles para banderas, banderas de España, banderolas, países del mundo, ciudades, provincias. Fabricantes de banderas y mástiles, empresa líder en el mercado Europeo, banderines Comprar Banderas mayorista online. 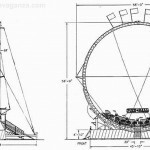 Super Loops history: The House design of this ride was only 40 feet tall and entirely scrapped after 3 units. He basically sold the rights to the name and concept to Larson. My grandfather, Louie Wallace, was the engineer who designed the Super Loops we know today from the ground up, including the single-trailer transport and hydraulic assist on setup, which made it so appealing for midways. Louie was an amazing guy and a life-long inventor. He passed away in 2013. 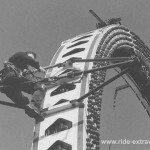 Reed Exposition Midways of Texas had a ride in the 1970’s called the Vertigo Roll. Any details on the history of this ride? David A. House…Are you the same Dave House that worked at Gullo-Haas Toyota in Houston back in the 70’s ? ?